Can you believe another month has nearly gone by since I last posted! Busy is an understatement, not just for me but I'm sure for you too. I would like to update you on a couple of changes. As most of you know I've moved out into the country and am no longer holding my regular monthly stamp clubs and, of course, as you absolutely know I'm not posting like I used to either. So, with all my changes, I've decided to give up my Stampin' Up Website and so you will no longer be able to go directly to my page to place orders. I AM NOT quitting Stampin' Up, but I am making some financial decisions that will hopefully work best for me and will work for my customers. Most of you who order from me do it directly on a monthly basis and so I hope you will continue to do so in the coming days and months. You can use the sidebars to go look at the customer page, you can look at the catalog on line and see the SU specials, but you will need to email or call me directly to place an order. Hopefully this will not be an inconvenience to any of you, my fabulous customers! There is a link on the upper right sidebar to email me! This isn't a recent card, but one of my favorites. 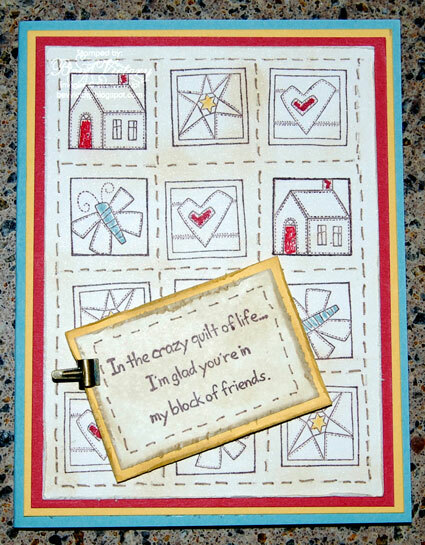 The stamp set is Quilt Quips (retired this summer) but it's one of my favorties and I made this card for a very favorite quilter. Hope you enjoy! 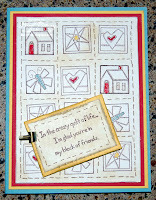 Thanks for stopping by - until my next post - happy stamping, scrapping or whatever make you happy!